Rainwater is a familiar element in our Northwest lives. Come investigate what it can do! Pump water up, dump it down, pool it, dam it, and let it flow over metal and wood. The folding glass wall opens up to the Sticks + Stones Outdoor Gallery to let the outside in. Play here is open-ended, purposeful, and flexible. 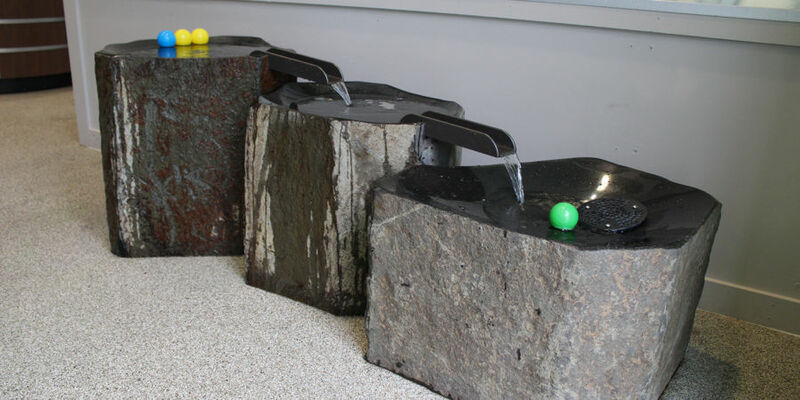 The Basalt Rocks are a fountain of beautifully crafted natural stone that feeds water from one to another in a cascading transfer of fluid motion across solid basalt. 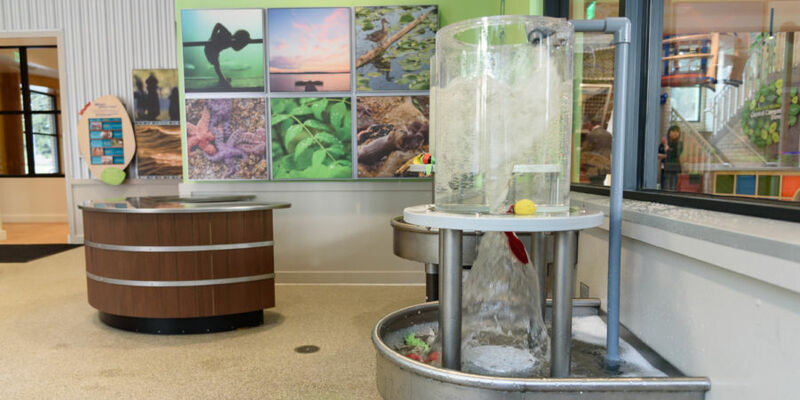 In this truly playful and sculptural aspect of the Water Gallery, kids can explore and play with water on the rocks. The Big Splash is the main feature of the Water Gallery. Kids experience suspense, anticipation, and surprise as they discover the power of water in motion. 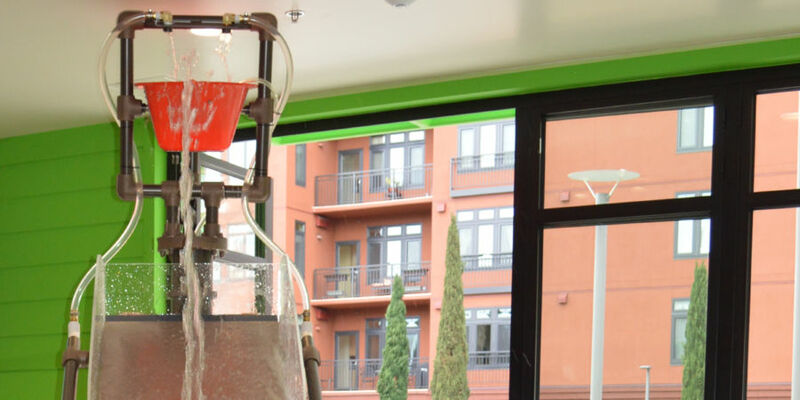 A great vessel at the top is slowly filled by manipulating pumps and pipes that results in a “big splash” when it reaches maximum capacity. 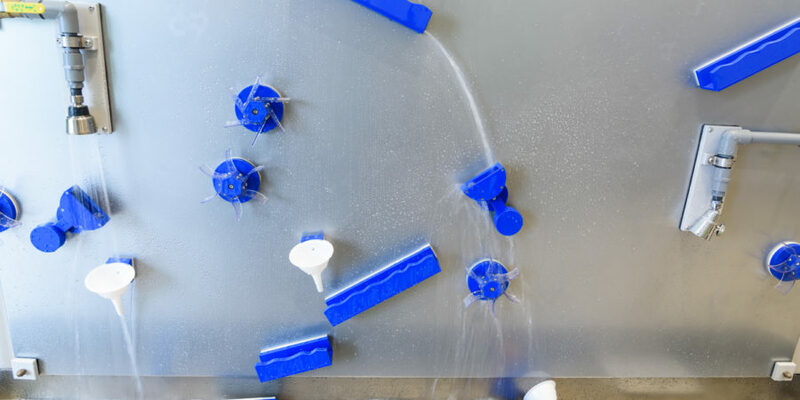 Change the direction of water flow using different channels and funnels, and watch how a water wheel is affected when water flows onto it. Use movable barriers to block water and create new pathways for objects to move down the stream. Be aware that the water flow in the stream may change if the Big Splash suddenly dumps a large amount of water! Younger kids splash and play in an area designed especially for early childhood development stages. 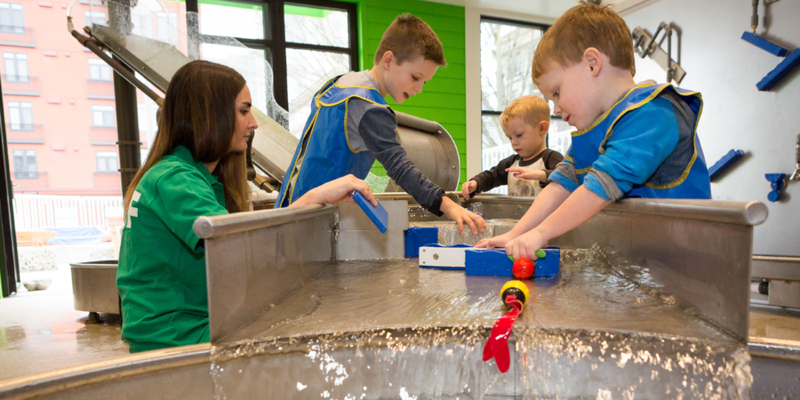 Features in the Tot Splash encourage kids to feel and explore with all their senses. 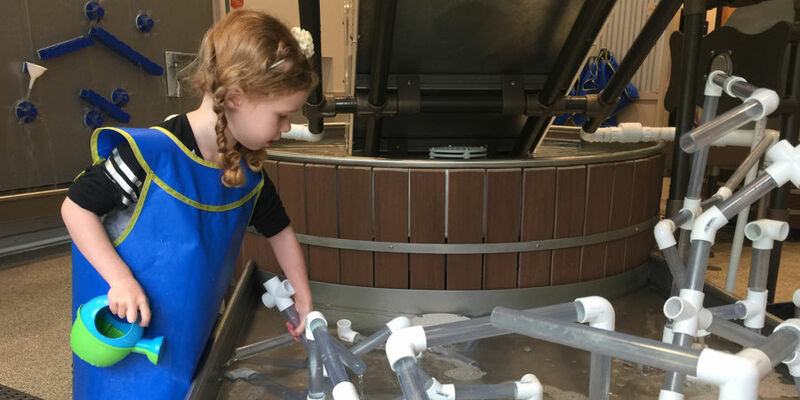 The Tot Splash has vessels for scooping, pouring, measuring, and tracking motion with objects in the water that sink, float, and move. 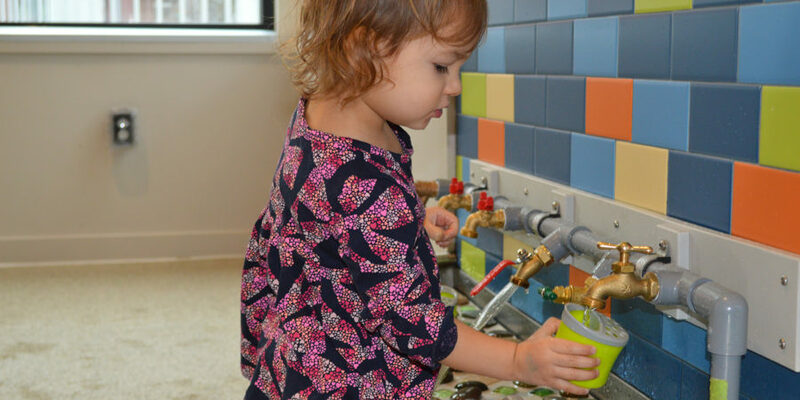 The Water Pipes & Bubblers Table lets kids experiment with water flow and fluid dynamics. With a series of pipes and connectors, structures can be created to contain and control the movement of water. 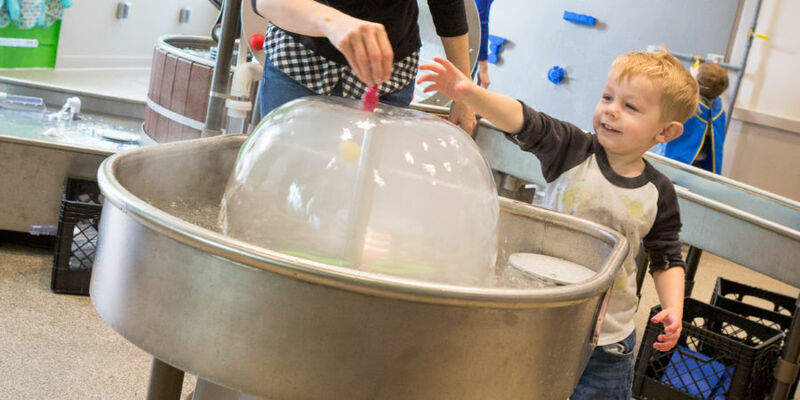 Kids experiment with water pressure by connecting and re-directing to observe and measure the cause and effect of the size, shape, and complexity of their structures. Watch what happens when different objects are added to the water vortex. A ball may float on top while other objects are pulled down. What will you discover?